No ordinary lookbook will do for Ada Zandition. The British designer, who launched her Autumn/Winter 2012 collection at London Fashion Week over the weekend, screened a short “fashion film” directed by Thomas Knights at the Estethica showcase in Somerset House. Simia Mineralis (loosely translated as “ape of the minerals” or the human race) plunges its protagonist into a looking-glass mashup of The Lady of Shalott, The Turn of the Screw, and Ziggy Stardust. A departure from last season’s Poseisus, which borrowed inspiration from the Greek god Poseidon, the film evokes the industrial revolution and the turmoil and conflict it created in its wake. 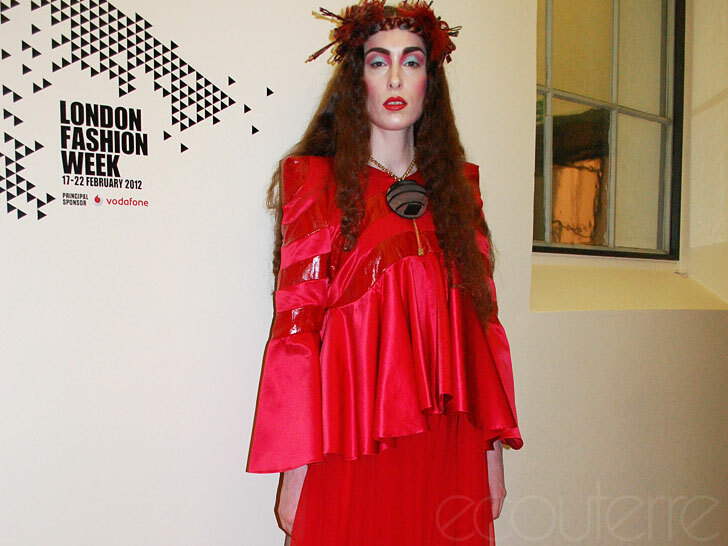 “This season we’re moving from the sea and into the jungle,” Zandition tells Ecouterre. By moving inland from the sea, Zanditon also alludes to the relationship between humans and primates, particularly the mountain gorilla, an endangered subspecies with only 700 individuals remaining. The designer, a cult favorite, brandishes her signature details: sculpted sleeves on a tailcoat, geometric bands that hew to the body’s curves. Zanditon eludes to the relationship between humans and primates, particularly the endangered mountain gorilla. To contrast structure with fluidity, Zanditon made liberal use of luxury fabrics such as fair-trade and organic velvet, denim, and cotton sateen; upcycled Chanel tweed; discarded eel skin; and vegetable-tanned leather. The result is a collection that is tactile and sensual, bold yet feminine. Once again, Zanditon collaborated with Luca Romanyi to create statement jewelry made from laser-cut walnut and cuts of the red eel skin left over from the dresses. The palette of blood red and midnight black is a direct reference to the silverback gorilla that serves as her muse. A keen supporter of wildlife conservation—previous collections have included references to bees, bats, and coral reefs—Zanditon uses her collection to highlight her concern for the great apes of Central Africa, where they’re at the mercy of the mining industry.